When people die, divorce or move away they often leave plenty of personal possessions behind. 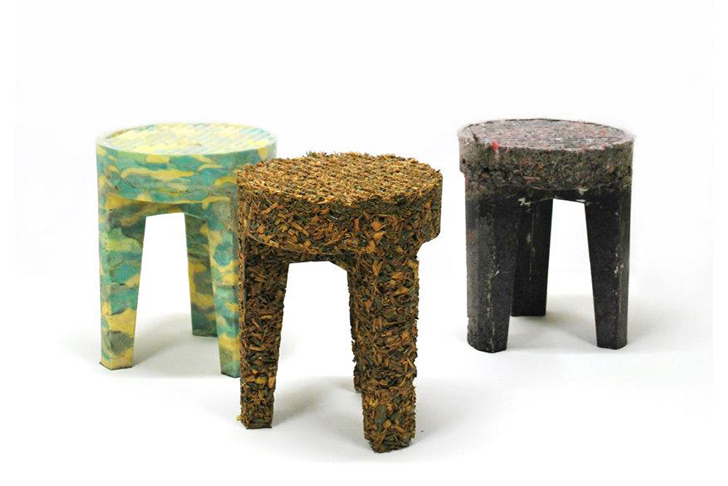 As a way of giving all those things a new function and soul, Dutch designer Joost Gehem created a series of stools that are made from recycled clothes, furniture and household products. Joost Gehem lives and works in Eindhoven, the Dutch city of Technology & Design, which is home to Dutch Design Week. We spotted Gehem’s fantastic stool while strolling through a place called Section C, which is an old textiles factory converted into designers’ workshops. Gehem’s studio at Section C is shared by other Design Academy of Eindhoven’s graduates, grouped as “Collaboration O,” who are doing amazing work. If you have any problems with the distribution of the contents in divorce or funeral of argue with the loved one, Joost Gehem is your man. He will grind up your stuff into varied raw materials and will compress them into a new shape. And you can even furnish your empty house with your past possessions recycled into a new stool. Joost Gehem lives and works at the Dutch city of “Technology & Design”, Eindhoven, home to the mind-blowing Dutch Design Week. We spotted Gehem’s fantastic stool while strolling through a place called Section C, which is an old textiles factory converted into designers’ workshops. Gehem’s studio at Section C is shared by other Design Academy of Eindhoven’s graduates, grouped as “Collaboration O” and doing amazing work. If you have any problems with the distribution of the contents in divorce or funeral of argue with the loved one, Joost Gehem is your man. He will grind up your stuff into varied raw material and will compress it into shape. And you can even furnish your empty house with your past all recycled into a stool.